This script only work against ESXi hosts running 6.0 Update 3 or 6.5 and there is code to verify before it performs either the Get or Set operation. 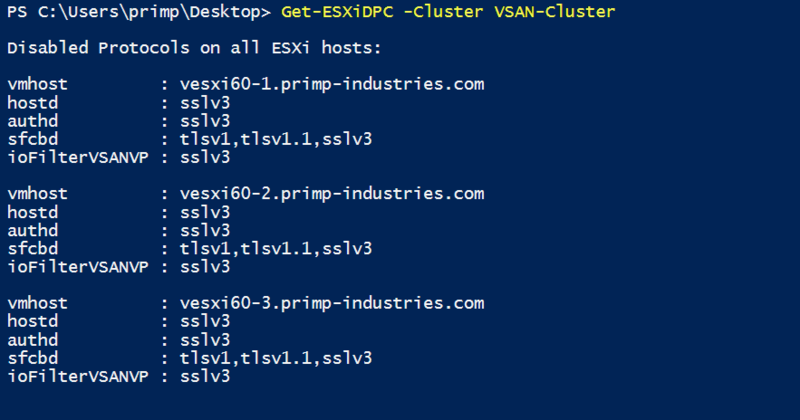 If you plan on making changes to the disabled protocols, please treat this like any other change by migrating all VMs off your ESXi host prior to the change. You will also be required to reboot the host for the changes to go into effect. The output above is for a stock installation of ESXi 6.0 Update 3 which by default, has SSLv3 disabled for all services. For hostd, authd & ioFilterVSANVP services, TLS 1.0, TLS 1.1 & TLS 1.2 are enabled by default. For sfcbd service, only TLS 1.2 is enabled by default. If we now re-run our Get operation, we can see that we have now completely disable TLS 1.0, 1.1 & SSLv3 and we have only allowed TLS 1.2 to be enabled by default. For the changes to go into affect, make sure to reboot your ESXi host. I would like to give a big thanks to Blair Fritz for helping me out with the initial testing of the script. We have also shared all this feedback with the folks who works on TLS Reconfiguration Tool and hopefully we will see these other features implemented in a future update. Want to inform and confirm that to disable TLS has recommended sequence i.e. vCenter, ESXi & PSC. So if disable TLS 1.0 only for ESXi that can could cause some issue? You’ll want to follow the recommended sequences as outlined by the VMware KB articles. Can You provide some additional guidance for less experience power shell user – how to use/run script in different environment ? 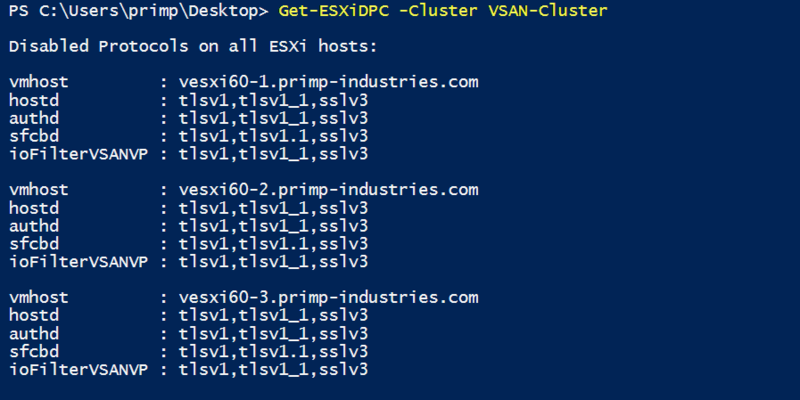 I noticed on hosts that I have upgraded from esxi 6.0 u2 to 6.5d the command does not work correctly. whats the value 386023424?, and this is only found in XML when we upgrade esxi from 6.0 to 6.5 and if its a fresh install. we dont see this! Thanks Ryan! Had that issue and your fix resolved the issue. Is it possible to disable SSLv3 on esxi6.0 U2. – do you know if the tool will support disabling TLS/SSLv3 at some date ? – running you script against the affected host says, it IS disabled ?! Thanks and appreciate for correction after change tlsv1_1 to tlsv1.1 its work perfectly. William, Thanks for the script. But this doesn’t cover the HA/FDM port 8182. Any suggestions? I tried the recommended “to fix port 8182 you need to create a Cluster Advanced Setting “das.config.vmacore.ssl.protocols” with value “tls1.2”, and then run a “Reconfigure for HA” on each host” and this did not work for me. create a Cluster Advanced Setting “das.config.vmacore.ssl.sslOptions” with value “386023424”, and then run a “Reconfigure for HA” on each host” and in some cases I had to reboot the host. FYI – With the release of 6.5 Update 2, the new TLS Reconfiguration Tool (7766806) now supports mixed 6.0 & 6.5 hosts in the vCenter, but not in the same cluster. It also now controls TLS for sfcb as well. If no entries are present these are the defaults built into 6.0U3 and 6.5.x. But your script reports the default for sfcbd as being disabled for sslv3, v1 & v1.1, instead of just sslv3. To fix the update function, you will need to add this ($line -notmatch “enableSSLv3:” -and ) into the if statement on current line 169 and insert this line ($sfcbResults+=”enableSSLv3: ” + (!$SSLV3).ToString().ToLower() + “`n”) at current line 175. P.S. It appears that the comments likes to change any “quotes” to “smart quotes”, so if cutting/pasting from comments, you will have to “fix” them before they will work. Is there a method to disable 1.0 during a kickstart build? Thanks. Script is great and working fine for newly installed hosts. But what is not working is using it on upgraded hosts from earlier versions of ESXi (like 5.5 or 6.0) to 6.5. After upgrade via VUM and running the script everything is looking fine. Get-ESXiDPC is reporting that TLS1.0, TLS 1.1 and SSL3 are disabled. However when validating it via openSSL connection using TLS 1.0 or 1.1 is still open. Thanks. But your Script put everything as a one-liner in the sfcb.cfg. As Result you cannot run your script twice. Furthermore if the file content is a one-liner it isn’t supported with our hostprofiles. I added “‘n” in the script to have every setting in an own line. What need to be change on ESXi 6.5 host for TLS1.2 to be enabled only? Can you please help me here. William, Does this work for 6.7? If not can it be updated? It seems to not be working for me.